One of the highlights of our last trip to Paris was visiting Tomat’s Epicerie Fine, a little shop tucked away in a courtyard off Rue Jacob that sells all kinds of gourmet delights including chocolate and culinary oils. 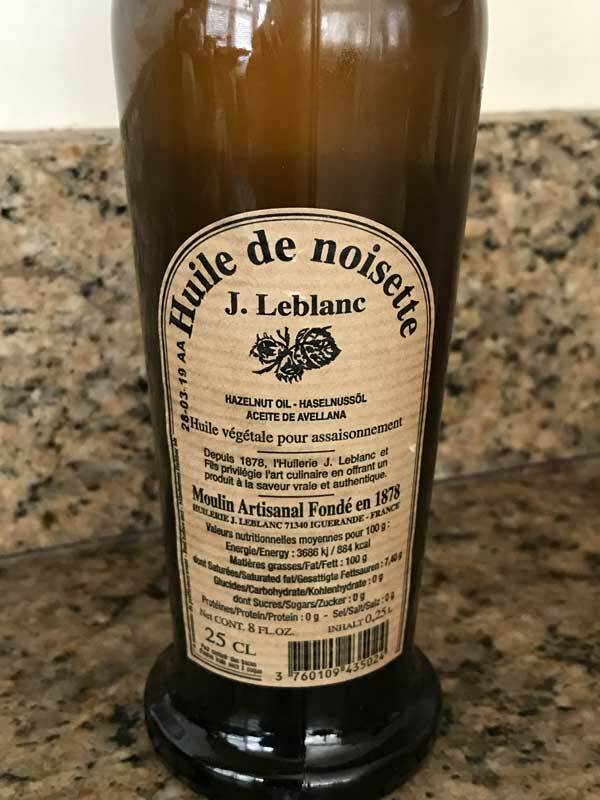 My favorite is the roasted hazelnut oil by Jean LeBlanc, a company in Burgundy. 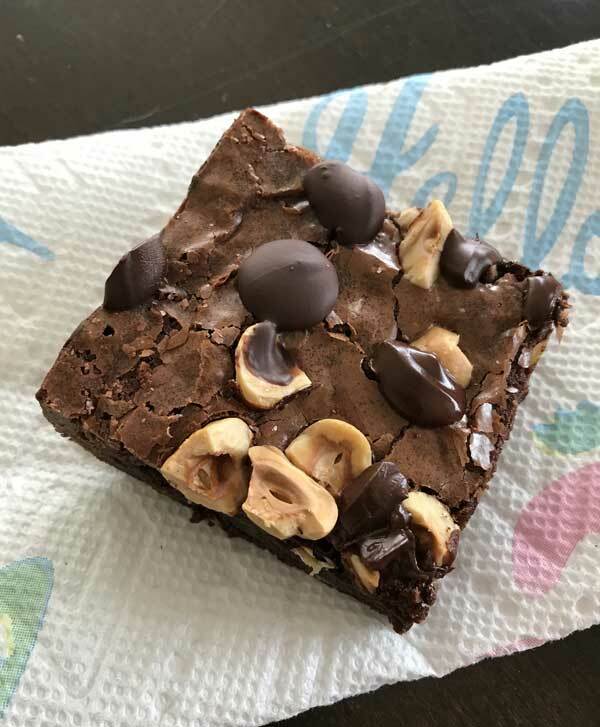 Since bringing home a bottle, I’ve used it mainly on salmon and in salad dressing, but today I finally tested it in hazelnut brownies. A little goes a long way so I only used a couple of teaspoons combined with some fresh toasted hazelnuts. Great results! The hazelnut oil flavor was subtle, which was probably for the best. Still, in the future I might take out a few teaspoons of butter and add in more hazelnut oil. The brownies are rich, fudge-y and have shiny tops. The recipe calls for 72% chocolate, and I don’t recommend using any chocolate less than 72% or they may be too sweet. My go-to for this recipe is Trader Joe’s 72% dark, which is combined with a bit of cocoa powder for even more chocolate flavor. I also sprinkle chocolate chips on the top as soon as the brownies come out of the oven. 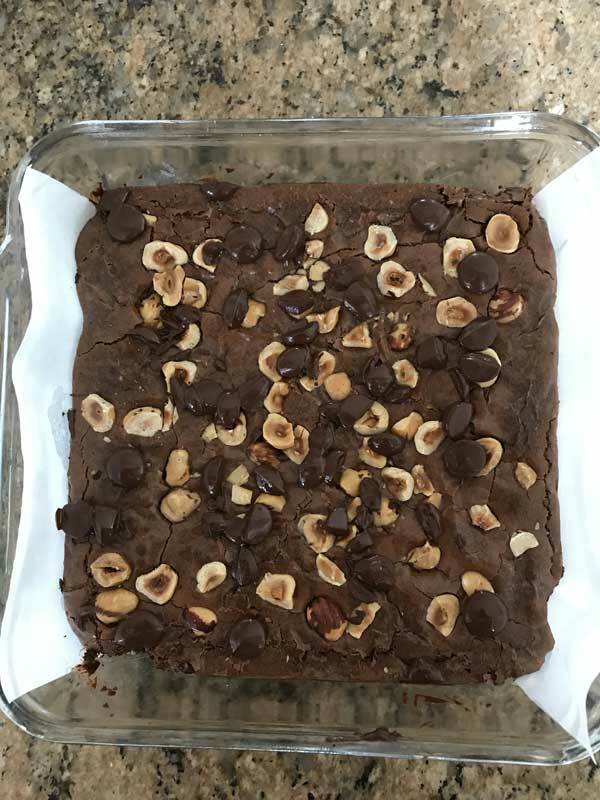 I made these as hazelnut brownies, but these are really just basic brownies enhanced with roasted hazelnut oil and hazelnuts. For basic brownies, just omit the nuts and use a neutral flavored oil. And one final note — if you happen to have some roasted hazelnut oil and are interested in how to use it on salmon, here’s what I do: Sprinkle salt and pepper on each salmon filet. Spoon hazelnut oil and a touch of honey or maple syrup over the salmon, then bake at 425 (I do it in a Breville convection toaster oven) until your salmon is just a little under your preferred safe internal temperature. These Hazelnut Brownies are made with 72% dark chocolate, chopped hazelnuts and roasted hazelnut oil. Preheat the oven to 350 degrees F. Grease an 8 inch square glass pan and line bottom with a strip of parchment paper that covers the bottom and comes up over two opposite sides. Remaining two sides don’t need to be covered, just greased. Melt the butter over medium low heat in a small saucepan. Add chopped chocolate and reduce heat to low. Stir until chocolate is melted and smooth, adding in the cocoa powder as you stir. When smooth, add the hazelnut oil and brown sugar and stir until it dissolves slightly, then remove from heat. In a mixing bowl, using a hand-held electric mixer, beat the eggs for about 1 minute or until frothy. Gradually add the granulated sugar and continue beating for 5 minutes or until thick and frothy. Beat in the vanilla and the salt. Fold the melted chocolate mixture into the egg mixture, then fold in the flour. Pour the batter into the prepared pan, sprinkle nuts over the top, and bake in the center of the oven until set and starting to crack, about 30- 35 minutes. Pull from oven and sprinkle chocolate chips over hot brownies so that they melt just enough to adhere. Let cool completely at room temperature, then chill thoroughly. To remove from pan, loosen sides without parchment gently with a knife, then pull up on parchment and take brownies out of the pan. Cut into squares. A two for one recipe!!! Thanks. I love how you adjust recipes on the fly. Mmmmm, these sound and look delicious!